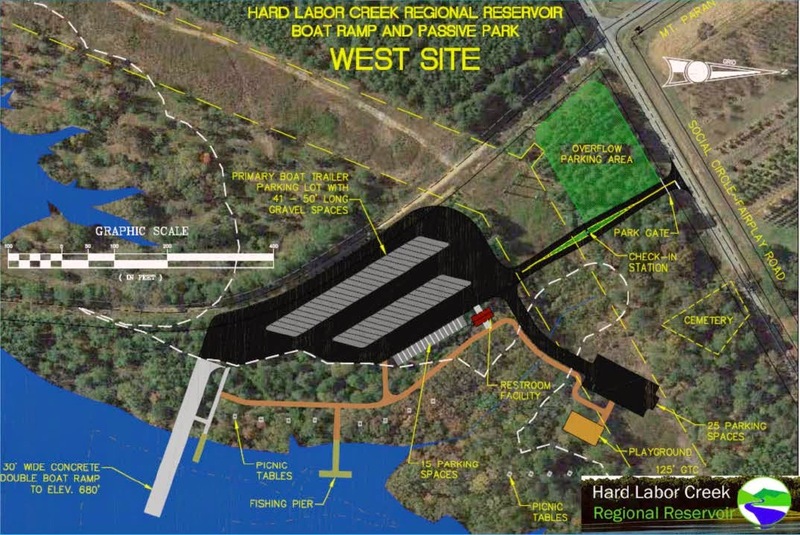 The selected site, just east of the second, more eastern bridge on Social Circle Fairplay Road, would include a 30-foot-wide double boat ramp, a parking lot, a restroom facility, and a fishing pier. It also could include walking trails. Total cost for development of the recreation site, including grading, paving, signage, provision of water, a septic system and gates, would be an estimated $985,000. The Board also considered a second site between the two bridges on Social Circle Fairplay Road but put a decision on whether to develop a facility there on hold. Project Manager Jimmy Parker told the Board that the eastern site provided better access to the lake than the western one. The western site is south of the intersection of Mount Paron Church Road and Social Circle Fairplay Road and just west of the future water treatment plant. Cost of developing that site would be $810,000, according to preliminary estimates. Neither the cost estimate for the east site nor the estimate for west site includes funds for a possible future passive park, which would add another $345,000 to the project. Those additional costs would cover a loop road, walking trails, picnic area and playground equipment. The west site is shown below. The map is oriented with the north to the right and Social Circle Fairplay Road to the right, or north. At the meeting on Aug. 19, Project Manager Parker said the Board in the future would have to decide who is going to manage the recreational facility. Walton and Oconee Counties are partners on the reservoir project, with Walton County assuming 71 percent of the costs and Oconee County the remainder. Future water from he reservoir will be split the same way. At present, the two counties do not have money for the treatment plant, and neither county needs the water at this time. 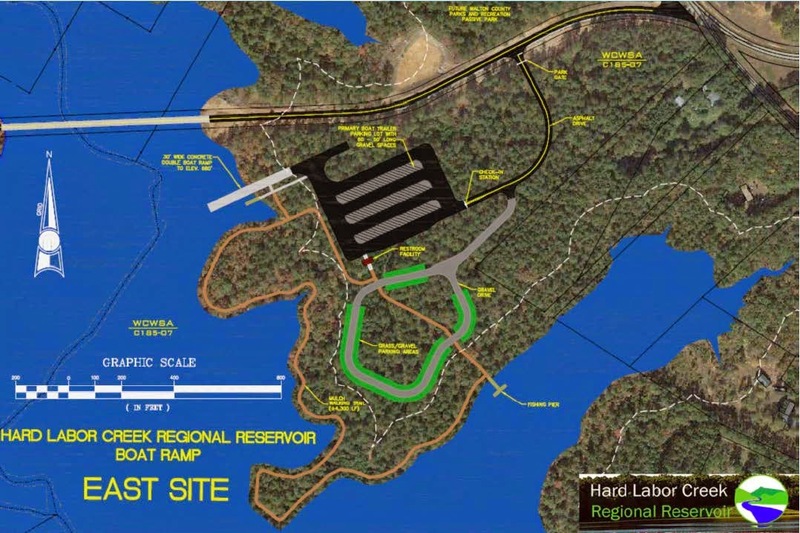 Parker told the Management Board at the August meeting that the clearing of the land for the reservoir was 45 percent complete and that the dam itself will be completed in March or April of next year. It will take two to three years for the reservoir to fill, depending on rainfall. Parker told me last week that the three-member Recreation Committee had not been able to meet as a group to review the concept plans and consider the Management Board decision to go with the east site but he expected to have feedback from all members to give to the Board at its next meeting. The Board is scheduled to meet at 1 p.m. on Oct. 21 at the government building in Monroe.